Har et staffeli konfirmasjons kort jeg helt har glemt å blogge! (og noen til, for en senere bloggpost.. ) Trenger visst litt opprydning i mappene på laptoppen min, den er så full at gjenværende plass vises i rødt ;) Dette er et nydelig stempel fra Abigail Larsson ♥ Motivene hennes kan man få kjøpt som digistempler hos Simply Betty Stamps. 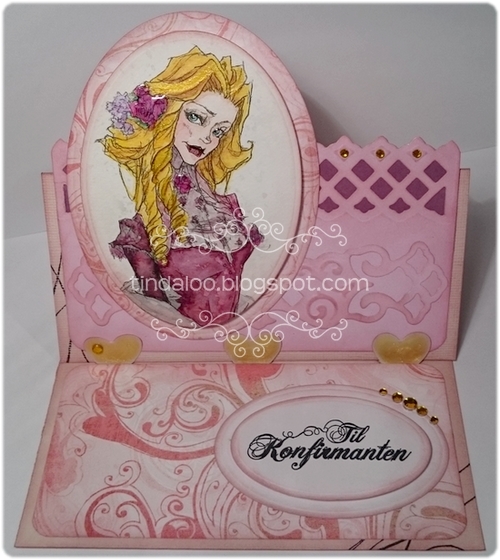 Here is one easel card for a really pink and girly confirmation :) Don't you just LOVE this lovely steampunk image from Abigail Larsson? ♥ You can find her images as digistamps at Simply Betty Stamps. ..For the Confirmand.. ..May all your dreams come true.. ..Today from childhood to youth you go. Do not forget that you reap what you sow.. I enter my card in theese fab Challenges: [Ends on] sjekket 20 nov.
Stamps/Images: Simply Betty Stamps - Steampunk Classic Coll 2 by Abigail Larsson 'Lavinia Outing'. Kort & Godt 'S-142' and 'M-225' text stamps. Magnolia 'BakgrundsSwirl Bröllup'. Papers: Bazzill cardstocks. Plain white cardstock. Basic Grey 'Two Scoops Collection - Swirl'. Embellishments/Tools: Elizabeth Craft Metal Die 'Stand Up Helpers 1-792'. Spellbinders™ Nestabilities 'Petite Ovals Large', and Borderabilities 'Petite - Lattice'. EK Success® Whale Of A Punch 'Large Circle 1.75'. Marvy Uchida punch 'corner rounder small 1'. Misc gold/yellow rhinestones. Techniques: I always use my Scor-Pal to score n fold my cards. I prefer Canson Montvale aquarelle paper (200 g/m coldpressed). My distress tools from Ranger Ink is always in use! ~ Tim Holtz® Mini Ink Round Blending Tool & the Inkssentials Ink Blending Tool and Foams. I used misc. Luminarte Twinkling H2o's Shimmering Watercolors, and Tim Holtz Distress Ink pads & markers to watercolor and distress image and papers. Glossy accents, Yellow Stickles glue from Ranger. Love the interactive feature! Well done! Thanks so much for playing Simon Says Stamp Wednesday “Anything Goes” Challenge! Så fint kort! Takk for du deltar hos kort o mania! I really love what you did with our recipe, this is a gorgeous, romantic, warm project. Thank you for joining us at Pile It On and please come back for the newest challenge. Takk for at du deltar hos Card and Scrap sin stempelutfordring.